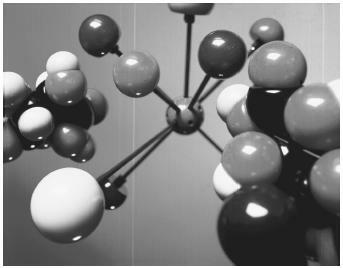 While molecules may be monoatomic (such as the inert gases helium, neon, or krypton), most molecules are diatomic, triatomic, or polyatomic, consisting of two or more atoms (some molecules may be a collection of thousands of atoms). A diatomic molecule may be homonuclear (e.g., O 2 or N 2 ) or heteronuclear (e.g., CO or NO). Similarly, a triatomic molecule may be homonuclear (e.g., O 3 ) or heteronuclear (e.g., HCN). 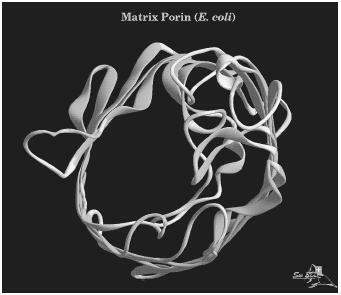 A three-dimensional computer model of a protein molecule of matrix porin found in the E. coli bacteria. In his 1916 paper The Atom and the Molecule , Lewis proposed that a chemical (covalent) bond between two atoms involves the sharing of electrons between the nuclei. Thus a single bond (for hydrogen, H-H) results when an electron from each atom forms an electron pair that is shared between the two nuclei (H:H); a double bond involves two electrons from each atom (e.g., the carbon-carbon bond in (H:) 2 C::C(:H) 2 ); and a triple bond involves three electrons from each atom (e.g., the carbon-carbon bond in H:C:::C:H). Such representations are referred to as Lewis dot structures. Lewis further postulated that an electron octet (and in a few cases an electron pair) forms a complete shell of electrons with spatial rigidity and chemical inertness—hence a stable arrangement. Determine the central atom. This may be the atom present singly (e.g., B in BF 3 ), the larger atom (e.g., P in POCl 3 ), the atom written in the center (e.g., C in HCN), or the atom with the largest number of bonds (e.g., C in Cl 2 CO). Determine the number of bonds needed for each atom to be bonded to the central atom and write the corresponding Lewis dot structure. Thus, for Cl 2 CO, each chlorine needs a single bond and oxygen needs two bonds; the Lewis dot structure would be (Cl:) 2 C::O. Note that a single bond needs a pair of electrons (one group), a double bond needs two pairs (also one group), and a triple bond needs three pairs (still just one group, since it points in one direction only). Count the total number of bonded and lone pair electron groups about the central atom. For Cl 2 CO it would be three (all bonded) groups. In the case of :NH 3 it would be one lone pair group and three bonded groups for a total of four groups. Models representing the arrangement of atoms in a chemical molecule. bonded and one lone pair electron groups about nitrogen, giving an electronic geometry that is nearly tetrahedral, and a molecular geometry that is pyramidal . Because two bonded pairs repulse less than a bonded pair and a lone pair, which in turn repulse less than two lone pairs, the H-O-H bond angle in water is not 109.5° as expected for a tetrahedron, but 104.5°, with the H-O bonds having been pushed by the lone pairs toward each other. For the trigonal bipyramidal shape, lone pairs always occupy equatorial planar positions. Thus, the molecular geometry of BrF 3 is T-shaped, rather than trigonal planar. Both physical and chemical properties are affected by the geometry of a molecule. For instance, the polarity of a molecule is determined by the electronegativity differences of its atoms (electronegativity is the ability of an atom in a molecule to draw electrons toward itself), and the relative geometries of the atoms within the molecule. The molecule BCl 3 , for example, displays a flat triangle (120°) with each Cl atom pulling electrons symmetrically, making the molecule nonpolar . In the pyramidal molecule PCl 3 , however, all chlorines are pulling electrons more or less to one side, making the molecule polar. Since polarity goes hand in hand with solubility, CF 4 is a nonpolar tetrahedral molecule not soluble in water, whereas SF 4 , a distorted tetrahedron, is instantly hydrolyzed by water. Chemical properties are also very dependent on geometries. For example, in the square planar molecule Pt(NH 3 ) 2 Cl 2 , the chloro (and hence the ammonia) ligands may be placed adjacent to each other (cis isomer), or they may be opposite each other (trans isomer). In addition to having different physical properties, their chemical reactivities are also quite remarkable. The cis isomer is an effective treatment of testicular, ovarian, and certain other cancers, whereas the trans isomer is ineffective. Similarly, the linear, nonpolar CO 2 molecule is inert, whereas the polar CO molecule is a poison. SEE ALSO Bonding ; Avogadro, Amedeo ; Bohr, Niels ; Cannizzaro, Stanislao ; Dalton, John ; Le Bel, Joseph-Achille ; Lewis, Gilbert N. ; Lewis Structures ; Pauling, Linus ; Thomson, Joseph John ; VAN'T Hoff, Jacobus .